After awful performance all year long, Wells Fargo is finally turning bullish. For traders looking for an opportunity to build a starter position into the rebound, now looks like as good a time. This has been a rough year so far for the financial sector. Year-to-date, 2018 financials as a group are down more than 8.6% on a price basis. And banking giant Wells Fargo Corp. (WFC - Get Report) hasn't been spared from the selling: Since the calendar flipped to January, Wells Fargo has shed about 12.4% of its market value. Given the recent market correction, that doesn't exactly make shares of Wells Fargo look appealing to investors who are already getting increasingly anxious as volatility continues to ramp higher. But one side effect of the leadership reversal in the broad market this fall is that laggards like financials could finally be getting to reverse course as well. Long term, Wells Fargo is finally looking "bottomy" this fall. And that could spell a key buying opportunity for shares. To figure out how to trade it, we're turning to the chart for a technical look. At a glance, Wells Fargo's price action looks ugly year-to-date. After a strong start to January, shares got slammed lower in February's correction, and have traded in a choppy range ever since. 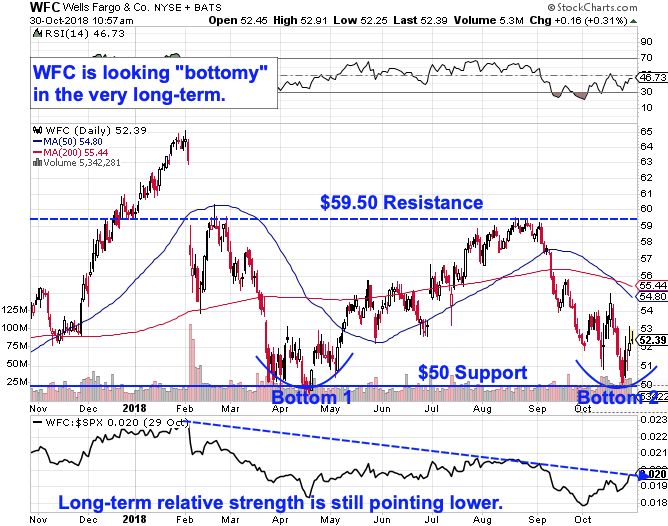 But looking long term, Wells Fargo appears to be forming a double-bottom pattern that could spell upside ahead. The double-bottom pattern looks just as it sounds. It's formed by a pair of swing lows that bottom out at approximately the same price level - in this case, that's $50 support, a price level that acted like a floor for shares back in mid-April, and again last week. The key breakout level to watch is resistance up at $59.50, the high that separates our pair of lows. As of this writing, that breakout level is still a fair distance away; but longer term, it could open the door to a re-test of all-time highs from the start of the year. Shorter term, a bounce back up to at least test that $59.50 level looks likely. Relative strength continues to be the most important secondary indicator to keep an eye on during this correction. Long term, Wells Fargo's relative strength line is still pointing lower, but critically, that indicator is testing a breakout of its own this fall. That jives with the potential for Wells Fargo to flip from laggard to leader in the final stretch of the year. It's still a little early to get outright bullish on Wells Fargo here, but for traders looking for an opportunity to build a starter position into the rebound, now looks like as good a time as any to take that trade.